Easy to Implement, Easy to Maintain Compliance and Quality Programs. Automate collection of all supplier and vendor compliance records including W9, Insurance, State Registration, Policy Acknowledgement, and other compliance documents. Monitor Compliance of Staff Prerequisite programs including integrated background checks, training, policy agreements, and other requirements. Automated alerts proactively notify suppliers, vendors, contractors, and staff of current and pending non-compliance issues that require attention. 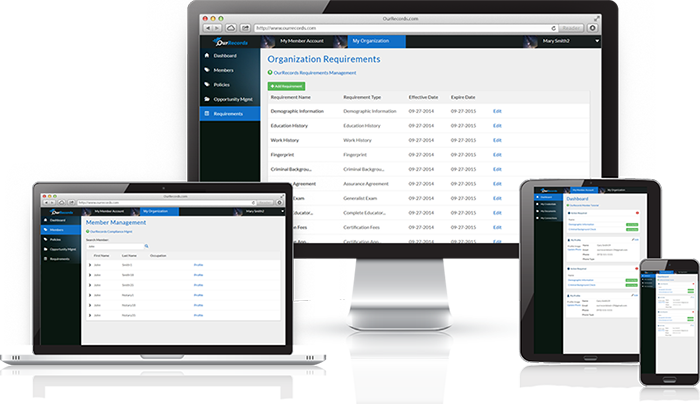 Centralized Location for all your Standard Operating Procedures, Policies, Quality Programs, Certifications, Production Specifications, and other compliance documents. Collect data and automate compliance reports and analytics. Automate distribution of required organizational and product compliance documents to your customers, auditors, and state regulators. Configure credential requirements for business partners and workforce. Invite Participant Companies and Individuals: With OurRecords engaging with thousands of participants is a snap. Review, Approve & Maintain Compliance: Submissions arrive securely. Reviewing, approving and requesting additional information is quick and easy! Stop managing suppliers and vendors by spreadsheet, and manage more suppliers and documents in less time. Ensure compliance is maintained for each item provided by your vendors and suppliers. Add specific requirements and classifications to specific vendors and suppliers based on unique needs. Share your documents and credentials securely with your customers. Ensure your customers automatically get specific updated credentials and requirements. Secure Intelligent File Transfers allows most efficient sharing of sensitive documents with anyone. No account needed by recipients! OurRecords Implementations provides 1 click engagement with thousands of vendors & suppliers. On-boarding for suppliers and vendors is “Self Service”. Staff training, solution branding, customization and communications setup is all included. Communicate directly with our expert support staff.